My daughter has 2 cats. She has moved to a council house and the lawn is covered with weeds, especially the ones I call clover - small and cover large areas. I have tried white vinegar but they are just coming back. Is there any pet friendly lawn weed killer product? Finding something pet friendly is a bit of a task... I would start with a mixture or whitevinegar, Dish soap, rosemary oil, and hot pepper flakes, or extract in water for added protection from insects and pests. Another alternative is to plant a known variety of grass seeds to outcompete the weeds. 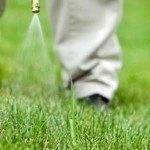 Otherwise, there are chemical treatments that work for grass very well.. Just be advised that when you go non-natural, it gets harder and harder to control weeds without damage to other plants/animals.